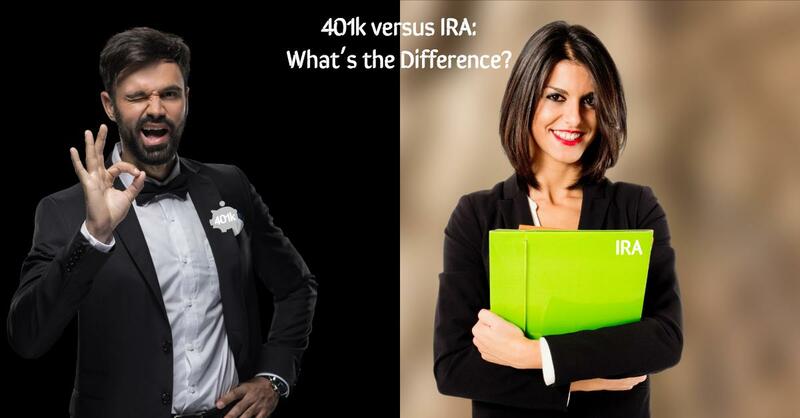 What is the Difference Between a 401k and an IRA? A 401(k) is a qualified retirement plan that is sponsored by an employer. It allows employees to deduct a portion of their salary and put it into an account that is invested for their retirement. An IRA can be opened by an individual (hence the name Individual Retirement Arrangement) and is another vehicle that can help someone save for their retirement goals. You can participate in an employer-sponsored 401(k) and contribute to an IRA; you do not have to choose one or the other. Before highlighting a few differences, let’s chat about the why. Why utilize either of these types of accounts? The short answer is that they are tax-advantageous vehicles that can help you get to your retirement goals. These types of retirement accounts can be tax-deferred or have tax-free growth characteristics. Most Americans enjoy the idea of delaying a tax bill from Uncle Sam and allowing their assets to compound. This is a powerful way to accumulate wealth long-term. Explaining the differences between how that is accomplished through a Traditional 401(k) vs. a Roth 401(k) or a Traditional IRA vs. a Roth IRA could be a future blog post. Participating in your employer’s 401(k) plan can be advantageous because they might match a portion of your contributions. This is about as close an opportunity for “free money” that you will ever find. A 401(k) makes it easy for you to put money away from each paycheck towards your retirement. Once you are enrolled, the plan automatically takes a portion of your earnings and puts it into your account. There are also ways to automatically contribute towards an IRA. To open an IRA takes some initiative by the individual. This can be done through many channels but we have chosen to use TD Ameritrade as the custodian for our clients’ IRA accounts. They are typically funded from your bank account (could be tax deductible or nondeductible) or from a rollover from your former employer’s 401(k) plan. The tax code allows you to contribute more money in a given year to a 401(k) than an IRA (for 2018 you can contribute $18,500 to your 401(k) and $5,500 to your IRA, unless you are over the age of 50 you can contribute $24,500 to the 401(k) and $6,500 to your IRAs). A couple of other differences between a 401(k) and an IRA are the investment options and the ability to take a loan from the account. IRAs will have greater investment options whereas with a 401(k) you are often stuck with the investment lineup that is provided by your advisor on your employer’s plan. Your investment options might be somewhere around 20 mutual funds versus an IRA that has access to thousands of investment options. Some 401(k) plans will offer the ability to take a loan from the account and pay it back, with interest. IRAs do not allow this. For the sake of keeping this a blog post vs. an all-out white paper, I decided to pick a few of the common topics that come up frequently in my conversations. There are other differences that might be worth considering when determining your strategy of how to divvy up your contributions to your 401(k) or your IRA (or a hybrid of utilizing both). Know that you are not alone in asking questions about the differences between these two common forms of retirement vehicles!